This beautiful Bauble Wreath we found on Canadian Living has everything we love from DIY Christmas ornaments, elegance, class and beautiful colors! Loop the ribbon through the top of the wreath. Make sure both sides are the same length, and use a small drop of glue to fasten it in place. Tie the ends together, and make a bow, this will be how you hand the wreath up. Fasten different sizes of Christmas balls to the base with the hot glue, beginning with the larger balls, finishing up with the smallest ones to fill in the holes. 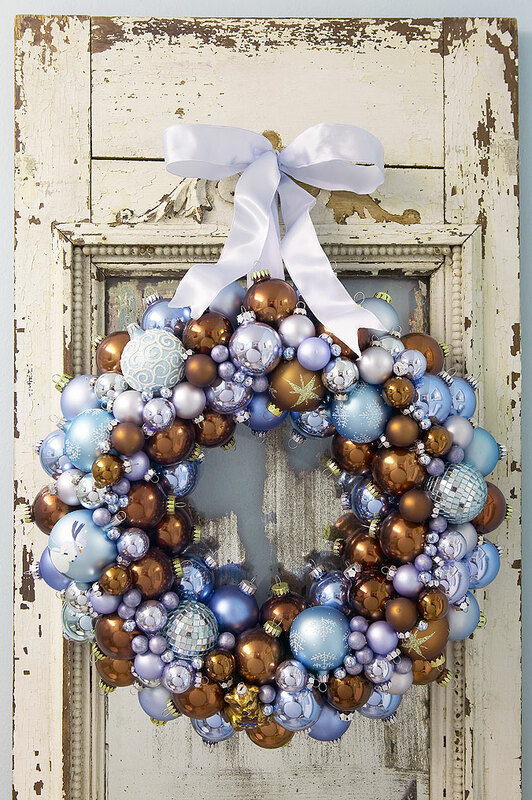 Using different textures, shapes, and styles of balls will make this wreath even more spectacular! be careful not to use too much as it can lead to a messy finished product.. Make sure that the colors of the Christmas balls complement each other. If you choose to use cardboard begin by drawing a large circle on the cardboard paper sheet using a plate and cut it out. Draw another small circle on the periphery of this large circle. Now cut out the innermost circle. This should form a wreath shaped base for the decoration. The next step is to cover this cardboard paper sheet with construction paper to match the colors of the wreath you are making, this isn’t necessary if you are creating an earth toned wreath.